Looking for a brain challenge on the cheap? Well, look no further, because TwoBlocks is 100% free. 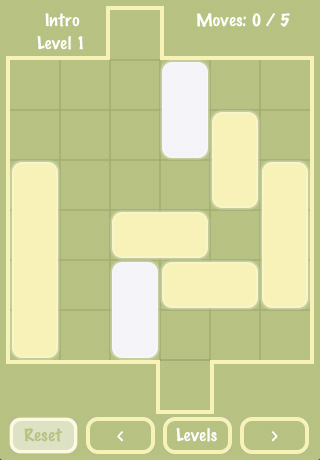 A very basic version of the ubiquitous sliding blocks puzzle, TwoBlocks has a few things going for it besides the price. One, the interface is actually very smooth, and the blocks are actually sized big enough that even people with bad eyesight and clumsy fingers like me can see and drag them about easily. Two, you have a choice of either solving the puzzle however you like or giving yourself the added challenge of solving it the minimum number of steps, as shown in the handy little display. Three, there’s a large number of levels in this game, and you also have a wide variety of difficulties to choose from. So what are the downsides? Well, there isn’t a lick of sound to be found, there is no way to compare scores with your friends, and the color choices seem to be hovering somewhere in-between week-old pea soup and urine. TwoBlocks definitely won’t be winning any beauty contests anytime soon, and it’s a good thing the blocks are sized so large, because I think the poor color choices would have utterly killed it at a smaller scale. Of course, the biggest issue is that there just isn’t a lot to do once you’re bored of sliding blocks around, but it’s certainly more robust than the free version of Unblock Me. If you’re the type who likes these kinds of mechanically based puzzles, then you have nothing to lose. TwoBlocks isn’t the prettiest app out there, but it’s an exceptionally robust free puzzle app. If you can stand the ugly color scheme, then you’ll be satisfied, as TwoBlocks is every bit as satisfying as Unblock Me or Blue Block, plus you save a buck. AppSafari review of TwoBlocks was written by Tracy Yonemoto on April 25th, 2010 and categorized under App Store, Free, Games, Puzzler. Page viewed 2945 times, 2 so far today. Need help on using these apps? Please read the Help Page.